"Creates a long lasting fresh smell." Does a great job removing any offensive smell in the house or any enclosed area. I even have an open container in my vehicle under the seat. Creates a long lasting fresh smell. In order for this to work well you need to have air movement. Sitting on its own, it is not fully effective. However, I will make this purchase again! Next time I place an order, I will be getting three to four of these. I also like the lasting effect that it has. 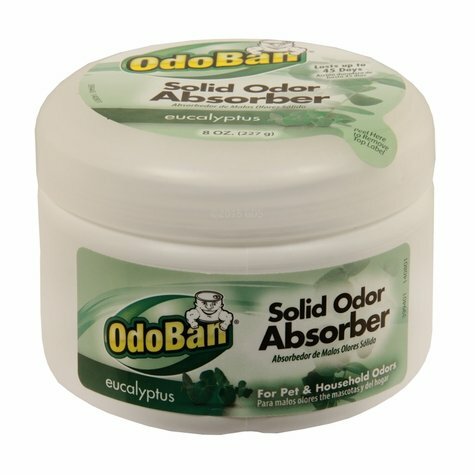 OdoBan Odor Absorber Gel -- 8 oz. The OdoBan odor absorbing solid gel traps and absorbs odors into the gel itself. Use in pet or odor problem areas in your home, office, RV/camper, gym locker, storage areas, garage or basement. OdoBan Odor Absorber Material Safety Data Sheet, downloadable in .pdf format. Click here to read the OdoBan Odor Absorber Material Safety Data Sheet.